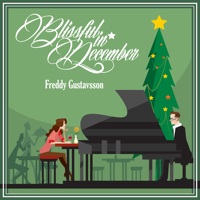 October 15 is the release date of my debut album “Blissful in December”. The songs were, as reported earlier, composed in the last fifteen years. Most of them have been kept private, in my head only. None of them were ever recorded or written down. Until now. On this project I had the great privilege to work with the talented Ioana Amarita, professional musician and composer, living in Romania. Our collaboration took place entirely online. It would usually begin with me sending an initial (analog) recording of a song over to Ioana, who digitized it and created an arrangement consisting of several instruments. She would send me the first version. After listening to it, I would sometimes get back with a few ideas or improvement suggestions, which in turn led to the next version of the said song. This was an excellent setup, which we both appreciated. Ioana also helped me with the creation of a so-called master of each song, i.e. an optimized high-quality version which is ready for publishing. The album cover is created by the illustrator Rizki Ardia. This was also a great collaboration. I am super happy with the result. The back of the physical CD cover is made by yours truly. The album is published by the American service provider CD Baby, which specializes in offering publishing and marketing services to independent musicians and bands. They connect the musician with online music services, copyright organizations, radio channels, retailers and more. Additionally, they make sure to keep a stock of physical records, so it’s possible to order from them. This concludes the pre-release reporting. I hope it has sparked your curiosity. If so you are invited to join the premiere this weekend.